1. Speed limit: It took us 35 minutes to fly from Saigon to Phu Quoc, but believe it or now, it took us an hour to go from the airport to our resort. Taxi drivers in Phu Quoc really obey the speed limit. I noticed this not just once. Feeling safe – yes. Feeling annoyed – YES. Main roads in Phu Quoc are new and wide open, but the speed limit is just 40 km/h in town – bleh. 2. Accommodation & beach:this time, we stayed at Coco Palm resort at Ong Lang beach. I personally really like this resort. Rooms for guests are located in a well designed and maintained garden of tropical trees. All of them face the beach. 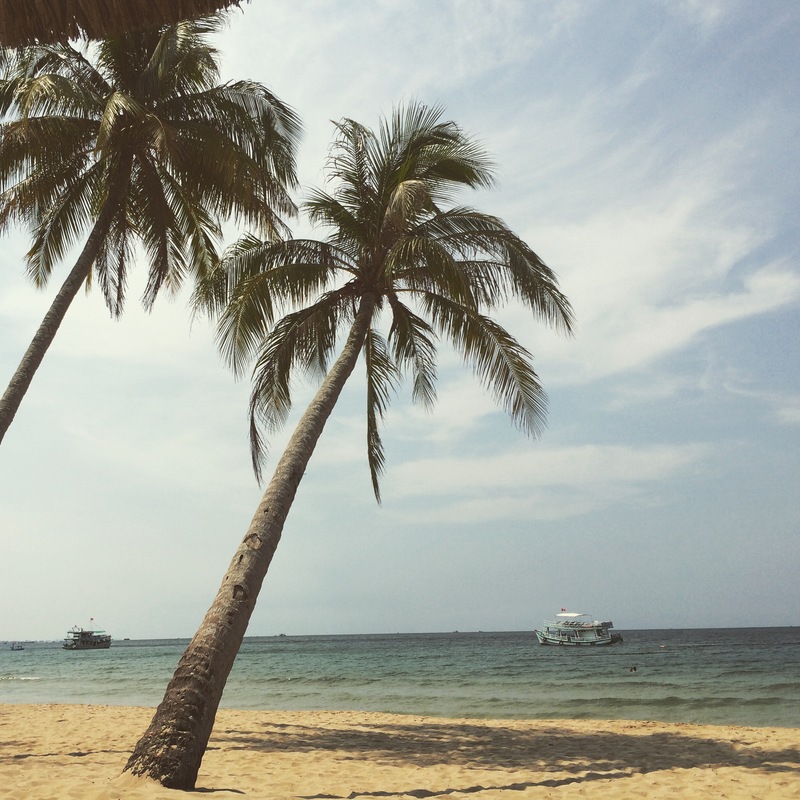 They have one of the best beaches in Phu Quoc. The beach has white and soft sand. It is so pure and clear that you can see what are under the water. It’s right next to the fancy Mango Bay resort in walkable distance, either along the beach or following the road, for dinner or other facilities. Some bad comments about this resort are (i) poor quality of food provided and (ii) there was no pick-up service available for us. But guys – the beach is really amazing. Boat tours do drop customers at this beach for them to swim! 3. Fishing & snorkeling:not to miss this for another time, fishing & snorkeling were in the agenda for this time. You just need to go to the resort receptionist to ask and book for the tour. Tip – Do remind them that you only want to do fishing and snorkeling, no local business visit included. Snorkeling can be done either in the South or North of the island. Given that we were in the North of the island, we chose the North tour to avoid 1 hour of transportation to the harbor in the South. The tour was provided by John tour with the price of USD17 per person from 9am to 5pm. We got picked up at the resort beach by the main boat. We did fishing, snorkeling and swimming at Long beach. Fishing was fun, even though we weren’t served the fish that we caught – boo. Snorkeling was really nice. Phu Quoc has a very divergent aqua ecosystem. However, the corals that I saw are not really colorful, most of them are grey in color. That was a very relaxing boat tour, and worth the money paid. 4. National park: Phu Quoc has high forest density. Top north of the island is the national park. There is a nice dusty path to get you across the forest from Ganh Dau cape. Going 5km from the cape, you will see the entrance to the park for trekking. Just lock your bike on the road side, it will be still there when you come back. It is really nice to go deep to the forest to observe trees, relax your eyes by the green colors and watch monkey climbing on the trees. Unfortunately, that is a two ways trekking and there is also not any specific destination. You just walk until you feel enough and then come back. We didn’t have chance to go to the Tranh or Da Ban Streams which are filled with water from May to October. Medium & difficult treks are not discovered either. 5. Dog farm: Phu Quoc dogs are really special for its intelligence. They have unmistakable line in the back and the habit of digging caves to stay or to give birth to puppies. Phu Quoc dog farms can be found in Nguyen Trung Truc street, where you will have chance to see trained dogs pick trash, climb the fence and race. Just a show, don’t put much expectation on it. If you have any intention to buy puppies, they do have the service to deliver puppies to your house with a fee. Yeap, exploring distant place is really exciting as we can see natural sightseeing & authentic cultures.